How many times have you been at the dentist, tools and mouthpieces in your mouth, and they are asking you questions and expecting you to answer? Or when you're eating out, and your waitress asks you a questions just as soon as you take a bite of food? Want a hilarious family game to play during the Holidays? Your search is over... the hilarious game of Watch Ya' Mouth takes you to that awkwardly hilarious moment that we have all experienced! Imagine the silly faces your friends and family will make while they try to say "Warm Beef Meatballs" while wearing cheek retractors. Get your group together (3-10 players), insert the cheek retractors and speak out phrases while your friends and family try to guess what each other are saying. I can't wait for my kids to open this game on Christmas morning so that we can all play together! I can already picture their faces and all of the laughs! I think the kids will be super excited to see Ma and Pa play this game too. Oh my! 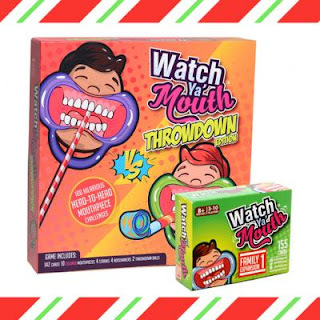 Watch Ya' Mouth Throwdown edition was awarded Top Holiday Toy of 2017 by Toy Insider and was also selected for the 2017 Amazon Holiday Toy List! It includes 143 Family-Safe phrases that are sure to have you laughing. Hours of hilarious fun for all ages! My daughter has a similar game. Even though it comes with several mouth pieces, I would be concerned with sanitary issues, especially if used by a group of people and the pieces were not cleaned properly. My suggestion is wash in hot soapy water, then pour alcohol over the mouth pieces...maybe twice..lol. It is fun to play.